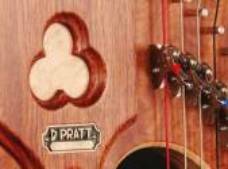 Note: Includes gut strings through 3rd Octave. Higher range gut strings available upon special request. 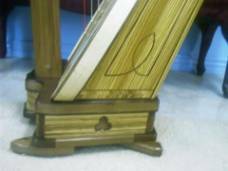 The Chamber harp may be purchased in natural walnut, cherry, African bubinga, zebrawood, birch, curly maple, birds-eye maple, sapele, or in some mixed combinations of hardwood. Contrasting woods in back corner and bottom body trim pieces may be selected at no extra charge. There is also no extra charge for selecting most colors of wood for the side strips. All woods and combinations must be agreed to by the manufacturer. Options below may be ordered individually, or in specially-priced option packages. Includes key, & padded transport cover. * This rosette is an item that we have been customarily ordering from a commercial supplier for this application. See photo at right. This no-cost option does not apply to other customer-selected appliqués or other commercially purchased carvings, which would be a special order, and priced case-by-case. Note: It is more economical to purchase the above Chamber Harp Options according to one of the following options packages. Confirm with us or your dealer any particular feature you may desire. 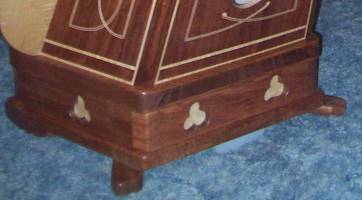 Below: Side strip corner bead inlays (#1), and Celtic knot inlay (#3) on soundboard. 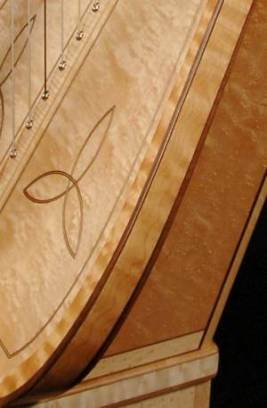 Harp is birds eye maple, with quilted maple side strips. 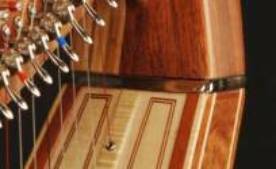 Below: Side strip corner bead inlays (#1), portion of soundboard border inlay (#4). Harp is bubinga finish. Below: Figured maple on back of wings (#2), and side panel body inlays (#5). Harp is bubinga finish. Below: Back body panel inlays (#5). Harp is bubinga finish. 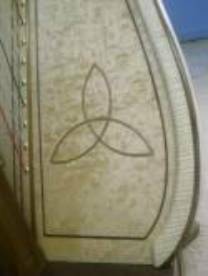 Below: Celtic knot soundboard inlay (#3), with soundboard border inlay (#4). 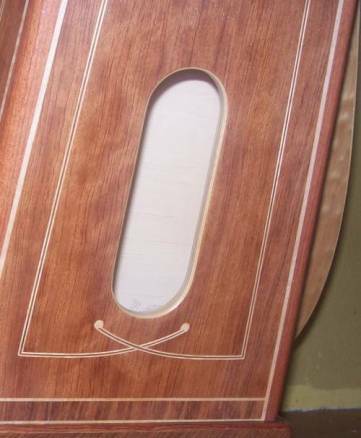 Below: Lower portion of side body panel inlays (#5), and trefoil motif in base (#6) Harp is bubinga with maple inlays. 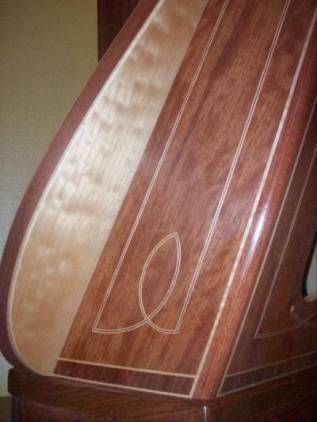 Below: Top of side strip corner bead inlays (#1), and top of soundboard border inlays (#4). 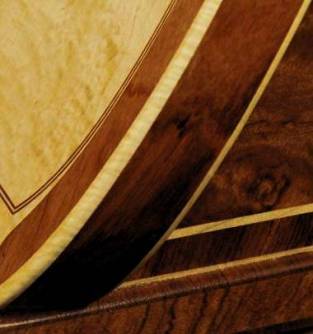 Harp is bubinga finish. Below: Side panel body inlays (#5), and side strip corner bead inlays. 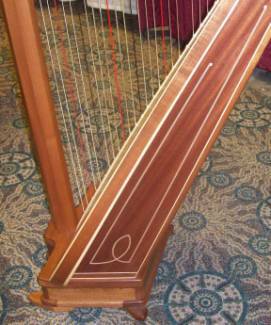 Harp is sapele finish. These suggested retail prices apply whether you purchase from one of our dealers, or Whether you may happen to purchase direct from us. We recommend our several dealers as you contemplate your purchase.